Dr. Bruce T. Hewett, M.D., shows some of the tools of the trade to Damien Farrow. But Dr. Hewett didn’t give up, instead turning to books, studies and colleagues to try and get a firm grasp on the topic. But back in the 1980s, physicians weren’t talking much about sleep problems. So he worked closely with the parents of his young patients and realized quickly that sleep issues can cause problems for children of any age—and that strategies should vary, based on their age and situation. Dr. Hewett helps parents set realistic expectations and teaches them what they can do to create an environment conducive to a good night’s sleep. In his past 30 years as a pediatrician—the first 25 in the Air Force—he’s learned to help parents set realistic expectations, and has taught them what they can do to create an environment more conducive to a good night’s sleep. He’s learned how the stimulation that teenagers crave—in the form of late-night television, videogames and computer surfing—can keep sleep at bay and turn their life cycles upside down. And—for all ages—he emphasizes the value of a healthy diet, exercise and plenty of sunshine. Sleeping pills are not the answer, he says. 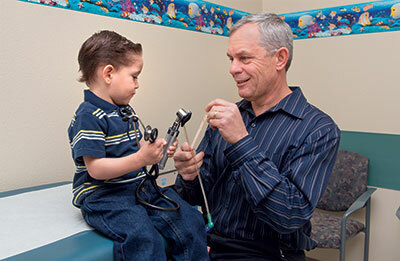 Dr. Hewett—whose practice is at the NorthBay Center for Primary Care in Vacaville—has turned to NorthBay.org to share his message with parents of all age groups. This spring he videotaped segments that offer some commonsense advice that could lead to a good night’s sleep, not only for the child, but the rest of the weary family. Children who are experiencing severe and ongoing sleep issues should visit their pediatrician. “If they come see me, I can work with them and their parents to create an individualized plan that should help them significantly,” he says, noting that he takes each child’s individual situation and the parenting styles into account. To make an appointment with Dr. Hewett, call (707) 624-7500. To see his video segments, visit www.NorthBay.org.